This project looked into what effect the shape of a parachute's canopy has on its descent performance. Six different parachute shapes constructed out of paper and tape were used. Three were in the shape of open boxes, while another three were in the form of flat sheets. Circular, square, and triangular shaped canopies were employed. All the parachutes had equal total surface area. For the open box shapes, half of the total surface area was applied to their skirts. The flat sheets had no skirt. Prior to conducting the experiment each parachute was weighed to ensure that each had the same weight. A smiley face pendant was used as the common payload. There was a 5 minute wait period between drops to ensure air currents caused by people moving in and out of the test area dissipated. Each parachute with its payload was released from a height of 12 feet. Time from release to ground impact was determined using a stopwatch. The six parachutes displayed a different average drop time. The parachute shape with the shortest descent time (1.76 seconds) was the open circular box shape. 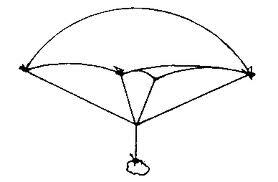 The parachute shape with the longest descent time (2.19 seconds) was the open circle shape. Based on visual observations, the ability of the open circular box shape parachute to enter a glide after being released helped it to stay airborne longer. The open circle shape parachute tended to descend with its canopy tipped at an angle. The resulting smaller projected surface area translated into faster descent times. Shape plays an important role in parachute descent performance.